I completed my P1/P2 with Don and Dave this fall and can't say enough positive things about their instruction and my experience in general. Their passion for paragliding is infectious and they really went the extra mile to help me get through all of the material and flights for P2 late in the year. I started out having no experience whatsoever and their approach to training seemed to be a perfect and safe balance of learning skills on the ground then building excitement and confidence through progressively higher flights from a training hill, to towing, then flights off Coopers. Their guidance through all stages was encouraging and positive. All equipment was provided during training, which was a good opportunity to try out a variety of gear prior to purchasing. Freedom Flight Park also provided a welcoming and friendly atmosphere and a great sense of community. I'd recommend training here to anyone, even if it meant travelling to do so! 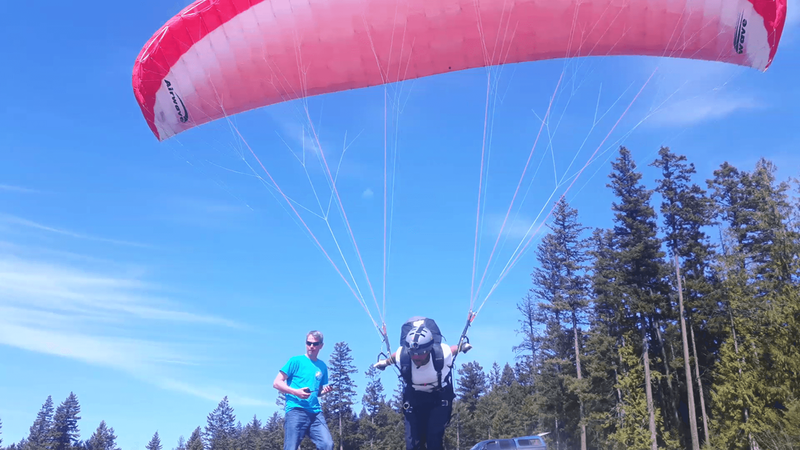 I could not have had a better experience learning how to paraglide than I did at the Freedom Flight School... Instructors Dave and Don provide exceptional instruction with a focus on safety while keeping the atmosphere fun and playful. They are approachable and cool, quick to offer encouragement. I was challenged to continually assess the conditions, equipment, identify risks and examine my knowledge and judgement. The park is a welcoming and amazing place to hang out even when you're not flying. And the flying is absolutely unbelievable! Whether you're keen to learn to fly solo, or up for a comfortable, beautiful tandem flight with a trustworthy pilot at the helm, this is undoubtedly an experience that will not be forgotten...! If one is interested in becoming a certified P2 pilot, the course is conveniently offered at each student’s pace and convenience. They offer sincerity and a determination to turn out smart, safe, and comfortable pilots. I couldn’t be happier to have found Freedom Flight Park and am deeply grateful for the friends I’ve made already at this inclusive and utterly amazing community. I cannot express my thankfulness to Don and Dave, my mentors and friends; this has been a true game changer for this girl!! Taking of from Coopers Launch. 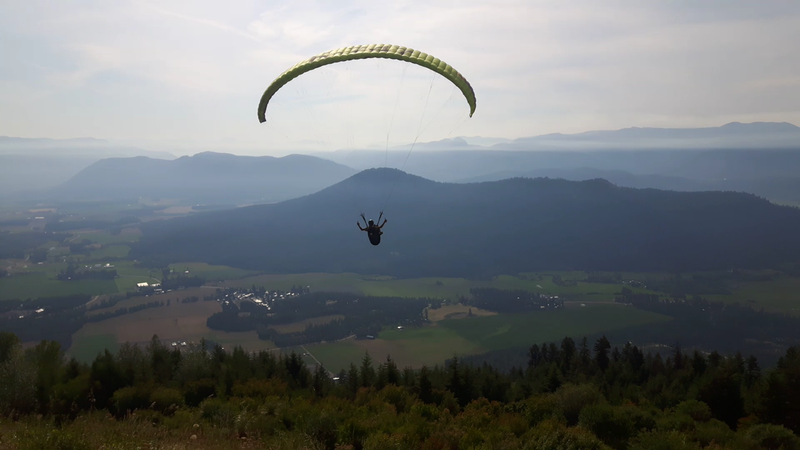 This Summer I spent learning how to paraglide at Freedom Flight Park after a few years of hesitating to make the decision. My initial interest was sparked by general enthusiasm for being outside and adventure. But learning to be a pilot offers a wealth of knowledge and experience to be had that it’s easy to become enthralled with the world of free flight. There was no better place to be influenced by a group of incredibly passionate pilots from all over the country. Most importantly, the dedicated instructors Dave and Don who put your education, safety and comfort above all else. Paragliding requires full awareness of the external and internal environment. Both Dave and Don honor that practice. Your progression is based on their assessment, but more importantly your own judgement on whether you are ready to fly. With the combination of amazing facilities, loving community and flexible instruction you’ve got a recipe for life changing experiences! Anyone who has considered free flight of any kind should consider training at the park. Now that I have the P2 license the team is helping me get gear for the next season a reasonable cost. With these guys, freedom is an understatement! Our scooter tow system for students to fly higher and higher. Getting some serious air time right off of launch. Great instructors with a lot of personal attention, highly recommend Dave and Don! Really great learning experience and a great place to take up flying! Yes, we work our students hard! Hands down one of the best adventures I've had in the Okanagan to-date. My friend and I did an hang gliding introductory course with Randy, who was very accommodating and patient with us during the whole course. He taught us the basic and fundamentals, and just after 1 hour, we were getting solid air-times off a small hill. I'm definitely coming back for the full course. Would highly recommend to someone who's looking for a thrilling experience. They are way more than just Paragliding I guess that is why they called it a Flight Park. What a Treat! Such a great way to experience flight not only if you just want to explore your curiosity to decide if it is for you, you want to continue to learn to fly, or even just review or improve your skills this place showed me that I came to the right place. They have a true desire to teach you to fly safely without pressure in a very progressive logical way. Thanks Dave, Don, Randy and all the other pilots who offered up the support and encouragement. I salute you all! We chose Freedom Flight Park because of their flexible schedule that catered to our busy lives and I am so glad we did! Dave and Don are incredible! They are patient, knowledgable and fun to learn from. The structure of their teaching focuses on an individual, helping them progress at their own pace and comfort level. I never felt pressured I was always encouraged and entertained. My trust in their teaching grew instantly and I was able to focus my mind on developing skills. 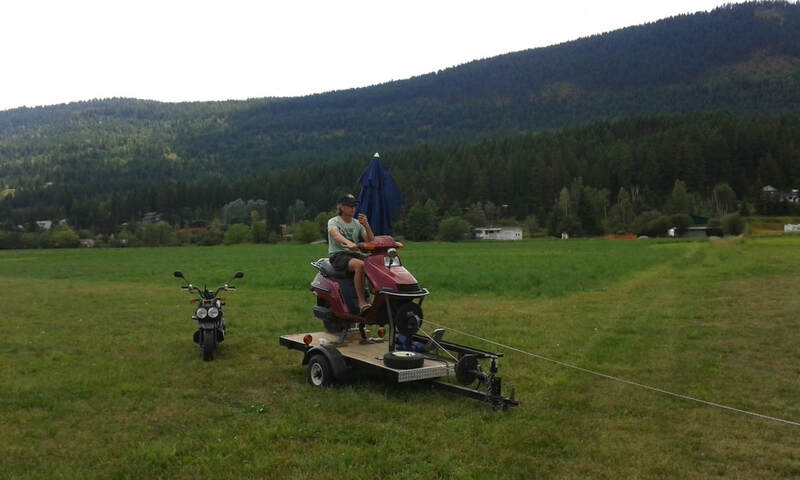 We started with kiting on a flat field, progressed our launches on a small hill then move to short towing, towing releases and finally a launch from Mt. Cooper. It was an amazing journey and we were able to have our high flights on the 4th day of training. Highly recommend Freedom Flight Park to anybody who is looking for a fun and safe place to learn paragliding. Went as a beginner paraglider. It was a great place to learn to fly as well as a cool environment to hang out and meet other pilots. Dave and Don were very knowledgeable, and I felt like I was able to progress quickly while still being quite comfortable at each step. Can’t wait to go back for my next level. What started as a trip to try out hang gliding turned into a life-changing adventure. My husband and I came back to the Freedom Flight School 5 times now, between July and October to complete our novice training and to spend as much time as vacation schedules would allow to fly with the birds! We have discovered our new passion in life, and my husband actually lost 40 pounds during this adventure - no time to watch TV and snack when there's flying to do! I am so grateful to instructors Randy, Terri, Dave and Don, who have created the most encouraging, inviting, friendly and safe atmosphere, not to mention excellent and thorough instruction. They are very perceptive, able to see exactly what the student is doing, and provide appropriate advice accordingly. They help you to progress at the right pace for you, as everyone learns differently. 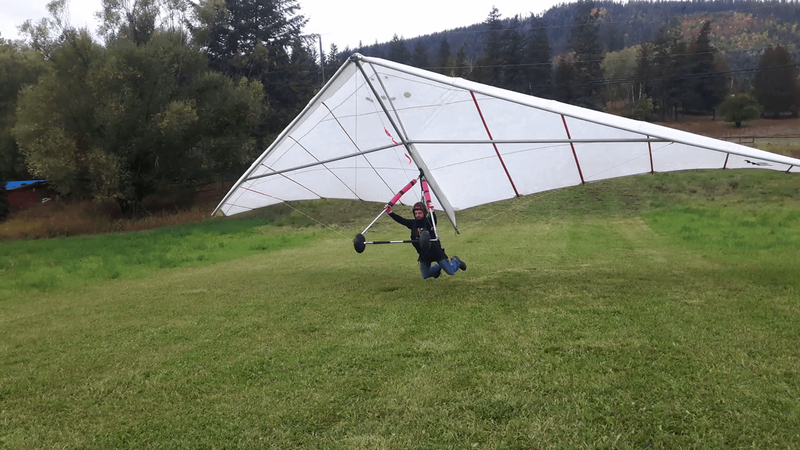 If there was a hang gliding school closer to Vancouver I might not have chosen to go so far as Lumby, but I am really glad this was the only school in B.C. because it allowed me to discover this magical place. As it turns out, Lumby also has the perfect geography and climatic conditions for flying, and the school has a wonderfully BIG landing zone. 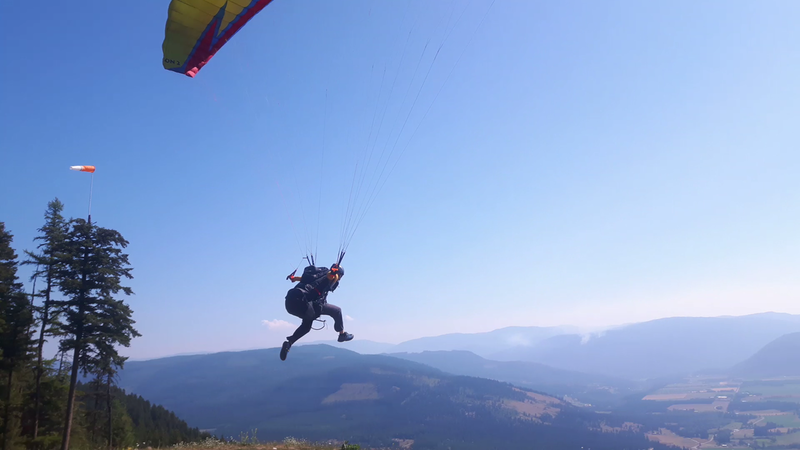 If I decide to try paragliding as well in the future, I will definitely do my training at the Freedom Flight School, as I trust the community there and I know I will get the best instruction possible. I did a 1-week hang gliding beginner's course this past summer and couldn't have been happier with the experience. Great instruction; great, supportive people at the flight park; and nothing will beat the feeling of launching solo for the first time from Cooper's launch. Highly recommended! The spirit of the Freedom Flight Park is simply awesome! If you are into just into trying out flying, the professional instructors there will take you up for a tandem on either paraglider or hanglider for a breathtaking experience. And if you're a pilot already, this area is one of the friendliest in Canada and also the safest (in my opinion) thanks to all the farmer's fields around in case you need an emergency landing zone! :-P I thank everyone there for the opportunity to fly and share this wonderful time this summer... Randy Rauck, Terri Dyke and Dave Underwood! See you next year!